When Governor Charlie Baker was elected to his first term of office four years ago, his first major announcement was the appointment of Jay Ash to the post of Secretary of Housing and Economic Development. All in all, Jay Ash’s tenure as Secretary of Housing and Economic Development has been among the most successful and remarkable of any Cabinet member of any administration in the state’s history. We know we speak not only for the residents of his native Chelsea, but also for citizens throughout the state, in thanking Jay Ash for his years of public service and wishing him well in his future endeavors. Chelsea’s State Rep. Dan Ryan has been inaugurated for another term in the legislature this week, and he said he is ready to tackle issues from transportation to opiate recovery research in the new term. On Wednesday, with the new class of the state legislature, Rep. Ryan took the oath of office along with Gov. Charlie Baker and the rest of the Commonwealth. It will be his third full term in office, and he said it will be an interesting term with new faces and a Republican governor in his second round. Ryan also praised House Speaker Bob DeLeo for his leadership in 2018, and his new term in 2019 – having also been sworn in as the House Speaker again on Wednesday. Ryan is now the vice chair of the Substance Abuse/Mental Health Committee, and also serves on the Transportation, Post Audit and Veterans Affairs Committees. 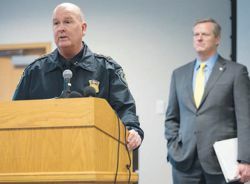 He said he has also been appointed to Task Forces charged with looking at the Commuter Rail and looking into issues related to the Opiate Bill passed last year. Ryan said the last session was very progressive, including legislation on criminal justice reform, the opiate bill, pay equity, the transgender accommodation bill and banning bump stock firing devices for firearms. 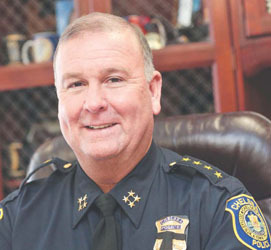 Police Chief Brian Kyes has been selected as the first-ever Chief of the Year by the Massachusetts Chiefs of Police Association. the first-ever such award handed out by the organization. This week, the executive board of the organization announced that Kyes was the recipient of the award, particularly for his advocacy in getting the municipal police training fund passed last summer. The award carries a $500 donation from the association to the charity of the recipient’s choice. In this case, Kyes has chosen The Jimmy Fund as the charity. On Oct. 29, Kyes received the Gregory A. Madera Public Service Award from the Massachusetts Association of Hispanic Attorneys at the Law Offices on Mintz & Associates. On Nov. 30, Kyes also received the Law Enforcement Person of the Year Award from the North East Massachusetts Law Enforcement Council Foundation (NEMLEC) at the Four Oaks Country in Dracut.